Bothies are simple shelters in remote places that are left unlocked to be used by climbers and walkers. A night in a bothy can transform a day out in the hills into a proper little adventure. Unlike staying in a tent, you can feel the solidity of the walls around you, and there's sometimes the chance to warm up by a fire. Bothies are mainly abandoned farm buildings and sometimes old mining buildings. There is one on Skye that is an old coastguard lookout station. Whatever the building was before, working parties from the Mountain Bothies Association have turned up and rebuilt them to a state where they can be used by anyone who stumbles past. Bothies are mainly in Scotland but there are ten that slip across into Northern England, and eight in Wales. The MBA website gives grid references for the location of the bothies they maintain. Make sure you can navigate precisely enough to find your bothy. You could try and cook on the fire but it's probably easier to take a stove. Probably what you want is something easy to cook and tasty, like the sort of food you'd want for camping. Alastair and I have often gone for pre-packed filled pasta which only takes a few minutes to cook. Other options are ration packs, precooked ready meals and noodles. It is also nice to have lots of nice snacks like biscuits and chocolate. Sometimes people leave food, gas canisters, pots and pans, and other useful things in a bothy. Which is nice. It's not a good idea to leave behind perishable food or anything that'll attract vermin (no offence to mice). Don't make our mistake, keep your food away from mousey! Hang it on a nail from a beam or put it in a solid tupperware box. Obviously these huts aren't wired up to the grid so you'll need some light. If you're lucky there'll be a fireplace. If you're really lucky there'll be a wood-burning stove. If you have the option of walking in with a bit of wood, you'll be all the cosier. If there is wood there when you arrive use it sparingly, ideally replace it. Don't cut down live wood or burn the estate owner's fence posts. When you leave make sure the fire is out and clean up the fireplace and leave dry kindling for the next visitors. In the Luib Chonnal bothy we were huddled in our sleeping bags trying to sleep when a bearded man came in. He had long shaggy grey hair and looked like he'd been dragged through a bush backwards. He sat down introduced himself and offered us a wee dram of whiskey. We had a fantastic night being regaled with stories about the old bloke's fishing and bird watching escapades. You can't guarantee there'll be a hairy Scotsman to entertain you. There won't be a telly. It's going to be a case of getting back to the entertainment system of ancient times: a pack of cards. It's not going to be a sauna. So bring what you need to be warm enough. There's often a spade in a bothy. If you need a crap, bury it in a hole well away from the bothy, any water courses and any paths. One option to get rid of toilet paper is to burn it with a cigarette lighter. If you can't find the bothy, or the roof has burnt down, what then? You could walk back from where you came from, or you might decide to bring a tent just in case. Either way it's worth thinking through what you might do. Have a quick read of the bothy code. It's mainly common sense, or stuff I've said here. If you use bothies frequently it might be worth considering becoming a member, donating or attending a working party. In the Alps the mountain huts tend to be great big things that sleep 30 or 40, have a chef and beer on tap. We don't have that in the UK's mountains but what we do have is bothies. Part of getting out into the mountains is about simplifying and leaving the luxuries behind. Bothies have a simple, cold and draughty charm of their own. 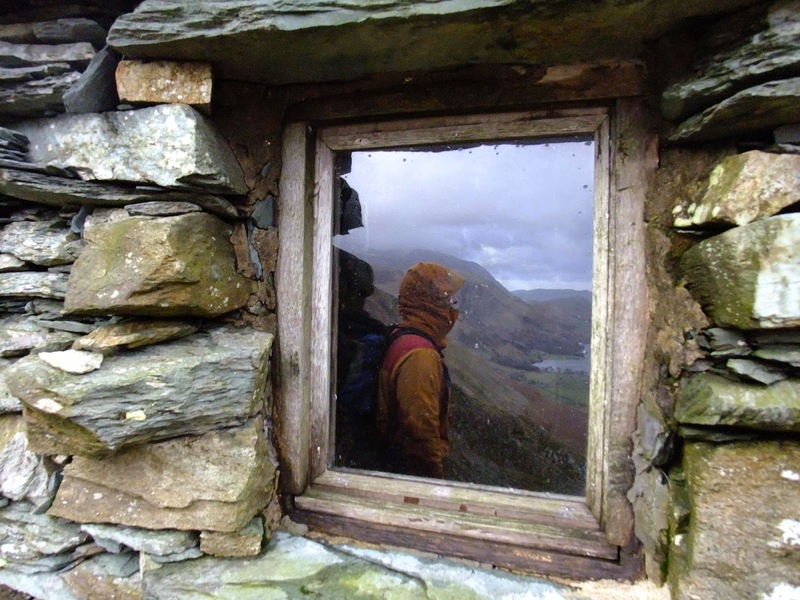 In a disused slate quarry, in the Lake District, a man opened a door and walked out carrying a tin of paint. The bothy, made of slate, was perfectly camouflaged against a background of slate. From a distance it looked like the man had just materialised. In the Spring, Alastair walked the coast to coast. I joined him for the first few days across the Lake District. After passing Ennerdale we veered off the propper route, up the valley to walk over Haystacks and past Dub's Hut, a bothy above Honister Pass. That's where we spotted the man who was a member of the Mountain Bothies Association (MBA) and was carrying out some repairs with his wife. "I didn't know there was a bothy in the Lakes," said Alastiar. "Actually there's three. Two of them are in this valley," replied Mr MBA. "Oh! Where's the other one?" The man pointed very vaugely to the other side of the valley. In the past the MBA have been a bit secretive about the location of bothies. Limiting who knows about them keeps them from being used by large parties (or for large parties). Apart from word of mouth the only way to find out where bothies were used to be to become a member of the MBA. Then they'd post you a list of grid references. Now you can go to the MBA website and find the location of the bothy you are interested in. Or google it and probably find a blog post describing staying there. 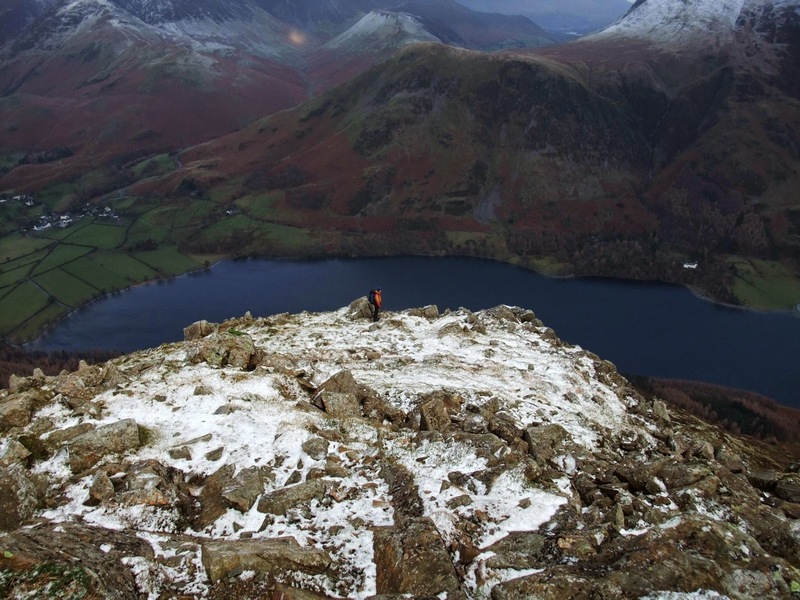 So when we planned a weekend in December in the Lakes, Alastair wondered about staying in the little bothy somewhere in that valley leading down to Buttermere. Al and I both like getting to the top of peaks and peak bagging can be a good motivator to get you to exciting new places. That's why ticking off Munros appeals to so many. But there are other interesting little destinations in the hills. Places hidden away below the peaks but no less a call for adventure. Walking under a waterfall, exploring a cave, wild camping by a hidden tarn. Spending the night in a cosy little bothy. But before our night in the bothy we needed a plan for the day. In early December, snow and ice for winter climbing hasn't yet arrived, but it's too cold and wet for rock climbing. The solution is a scramble. Scrambles are easy climbs. You'll need to use your hands a bit but you wear your normal walking boots. The best scrambles tend to be ridges. In the lakes there are some classics such as Striding Edge and Swirral Edge on Helvellyn and Sharp Edge on Blencathra. On Saturday we left Borrowdale YHA and drove about 600m to Stonethwaite. We set off up the same river we'd walked along on the Coast to Coast but this time the other side. We followed this round the bend into Langstrath and found the start of Cam Crag ridge. This ridge is a Grade 2 scramble, and the internet seems to be full of hyperbole about how good it is. One website claims it to be the best Grade 2 in the Lakes. The rock is lovely grippy volcanic stuff, even in the damp state we found it in, and there are some lovely sections of scrambling. It's a bit disjointed, with lots of walking sections between the rock steps. And there is easier ground to the left so you have to seek out best scrambling and you never feel particularly commited. To counter this we chose an off-piste diversion up something harder looking up on the right. It started off as we'd hoped, a bit harder. I put a sling around a chock-stone and made a big step up. Then the climb decended into choss. Hanging on to a handfull of heather and stepping onto a precarious pile of loose rocks, I got back onto safer terrain and brought up Alastair with a belay on a rock spike. From the top of the climb we thought about the easiest way down as we wanted to have lunch back at the YHA. An easy option was just to decend to the side of the ridge and follow the path we came in on. But since we were up high, a more interesting route jumped out of the map. We headed north to Tarn at Leaves. Then, because we fancied seeing a bit of a view, we climbed High Knott. We did alright with the view, especially picking out Fleetwith Pike. Our decent back to the car wasn't our finest moment. We clambered down some pretty unplesant craggy stuff and found ourselves trapped in a farmers sheep field. We had to then hop over a few drystone walls before getting back on the path we came in on. YHA. Grill on. Cheese on toast. Tea. Bourbon biscuits. Back in the car park we stood by the open boots of our cars. We unpacked our climbing stuff and packed our warm clothes, sleeping bags, food and, with any remaining space, firewood. While we did so it started raining. We drove to Gatesgarth Farm and left our cars and walked up the valley in the rain. The cloud came down and the light quickly disappeared. We had our grid reference harvested from the internet and this matched up with a small square in amongst crags high in the valley. If we were going to find the bothy we'd need to pay close attention to the map. The path followed up beside a waterfall then swung right and then back left. We predicted the next move of the path on the map and waited to see it happen. When we crossed Warnscale Beck we knew the Bothy was no more than 150m away. I started counting paces. At just the right moment a path led off to the right and at the top of it there was a small grey building. Half of the structure was ruined but the other half had a solid roof. Inside the place was pretty cosy. There was a fireplace, a few candles, and a raised sleeping platform around the edge. We got a fire going, and cooked our pasta. Then we sat around drinking spiced rum until we decided to turn in at 9pm. Bothies have a tendency to be cold and drafty. Warnscale Head is just cold. Even with the fire going full tilt it didn't warm up much. Wind and rain started hammering the little place. In my sleeping bag with two fleeces on and a wooly hat I was as toasty as you can be in a slate hut in December and slept soundly. Around 3am I'd been dreaming about a strange scratching sound and then somehow realised that I was awake. Mouse! I put on my head torch and examined our food stash. The little fella had nibbled through our carrier bag and had been munching into the bourbons. I hung the carrier bag up on a beam and Alastair rekindled the fire. Sleep mark 2 was more successful and when we woke up we were surprised to find it was 9am and we'd slept for 12 hours! It was still windy but the rain had stopped and although it was overcast, the summits were out of cloud. We headed up to Haystacks and then on along to High Crag and High Stile. At Scarth Gap we passed some guys who'd been staying in the Black Sail Hut YHA. On the long slog up High Crag we got thinking. Maybe we could plan a trip around staying there?